Sewage overflows and backups can happen anytime. When your plumbing fixtures fail, or when a storm hits your area, water can quickly become a problem. Heavy rain and drain clogs can also cause sewage backups. Within a short amount of time, your walls, carpet, flooring, ceiling and personal property can become saturated. 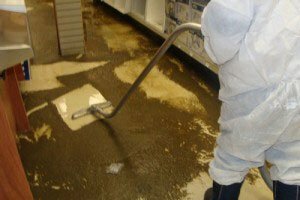 Sewage damage cleanup is never a fun or easy task and must be done correctly to prevent cross contamination and to prevent the occupants or our technicians from getting sick. Sewage is considered to be a bio-hazard, proper protection and sewage cleanup techniques are required to return your home or building to a usable and safe place. If you experience Sewage overflow or backup in San Francisco & Bay area, don`t hesitate to contact us immediately! Sewage backup should be considered an emergency and dealt as quickly as possible. We are the water damage restoration specialists with specific training and expertise to safely restore your home or business. We work quickly but safely, extracting the moisture and then decontaminating and thoroughly cleaning surfaces. GCD Restoration is an IICRC Board Certified Company fully licensed and insured in the area of both General Liability and Pollution coverage. The plumbing professionals at GCD Rerstoration in San Francisco & Bay area are trained to work with homeowners and businesses alike, offering prompt water damage cleanup and repair service in San Francisco that you can trust. We are available 24/7, 365 days a year, when you need service the most. Do not wait and call us at (650) 835-4447 .